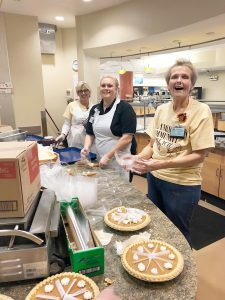 For the fourth year in a row, Western Maryland Health System partnered with several organizations to ensure that thousands of area residents enjoyed a delicious Thanksgiving dinner. 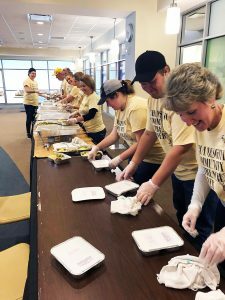 Along with Our Lady of the Mountains Roman Catholic Parish, Mineral County Aging and Family Services, Allegany County Human Resources Development Commission and The Pharmacare Network, WMHS teamed up to serve over 2,800 meals across the tri-state region. The number of meals prepared this year marked a new record, with 1,383 dinners consisting of turkey, stuffing, mashed potatoes, cranberry sauce, rolls and pumpkin pie being delivered out into the community. Meals went to churches in Frostburg, Westernport and Mt. Savage, to 13 different group residential communities in the area, to Mineral County Meals on Wheels clients and to home bound seniors. Another 1,235 meals were served at WMHS, where visitors could either eat in or take out. In addition, 100 portions of turkey were donated to the Union Rescue Mission and 90 meals were given to first responders as they checked in patients at the WMHS Emergency Room. Flu shots were also made available, with 15 being administered in the local high rises and 43 more at WMHS during the dinner. Overall, 200 volunteers made up of WMHS employees, their familes and friends and other community members served 723 pounds of turkey, 288 Pumpkin Pies, 100 pounds of cranberry sauce and 250 pounds of bread for stuffing, all expertly prepared by Aramark, the on-site food coordinator for WMHS. “Without a doubt this is one of the most rewarding projects we do because it reminds us of what a hot, nourishing meal means to people,” Wilson said.